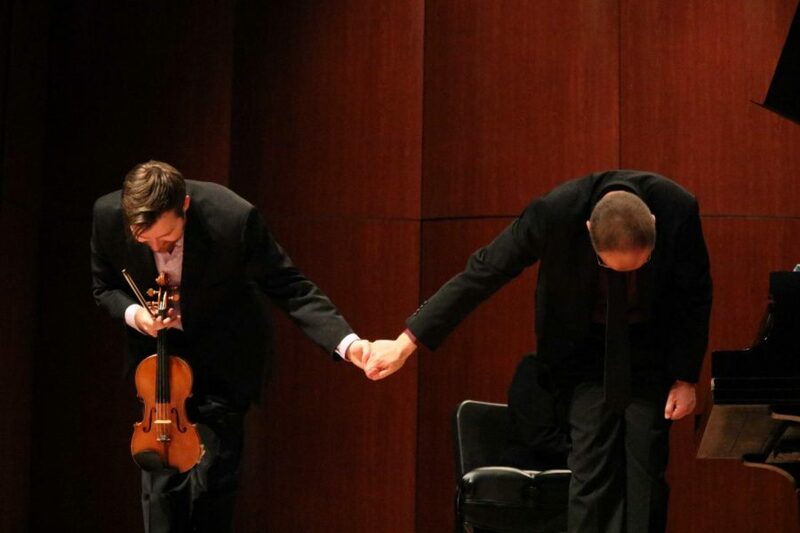 Musicians Stephen Nordstrom and Dominic Dousa performed on Thursday, November 8, 2018 at the Fox Fine Arts Recital Hall. 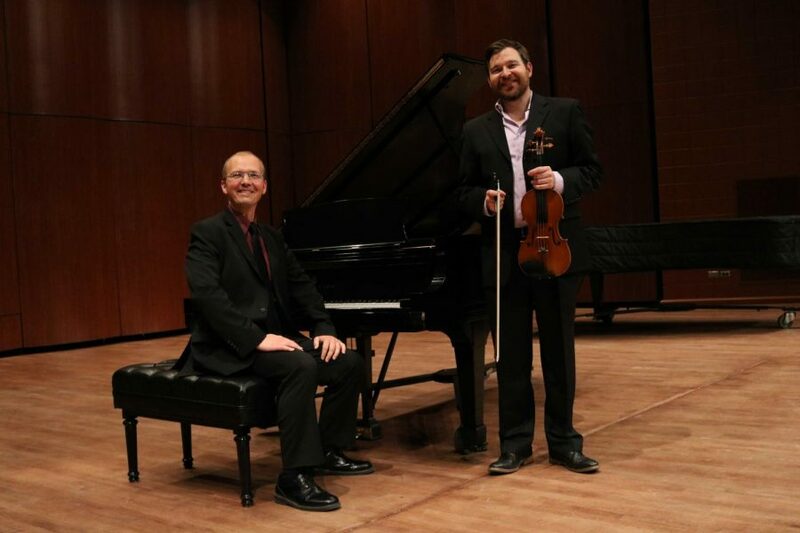 The UTEP Music Department presented Musical Landscapes, a faculty recital featuring Stephen Nordstrom and Dominic Dousa on Thursday, Nov. 8, at the Fox Fine Arts Recital hall. The recital presented work composed entirely by Dousa, premiering for the first time ever to the public. The program consisted of two works by Dousa, the first being the world premiere. Composed for piano and violin in the summer and fall of 2018, Five Desert Portraits is a collection of pieces inspired by the characteristics of the Chihuahuan desert, as Dousa said. The collection opened with A Desert Pastorale, which reflected the rural desert and adventuresome qualities that come with exploring the desert land. Desert Abloom featured a more relaxed mood, as described by Dousa, with ‘flowering’ melodies. A Distant Land held the purpose to evoke quiet moods depicting the beauty and grandeur of the desert. Some of these pieces had an intimate connection to Dousa’s love for his family, like Desert Adventure, which reminded Dousa of his excursions into the desert with his son and nephew. The work finished with Dusk, a tranquil piece that depicted the splendor of the desert’s clear night skies. The composer accompanied violinist Nordstrom on the piano in this collection. He also included a previous original work, which also related to the theme of landscapes. His 2011 work, Sonata for Violin and Piano, featured three movements: From a Distant Star, Echoes of Spirits Near and Far, and The open Road Ahead. The moods of these pieces were inspired by one of Dousa’s favorite landscapes in the Great Plains and Rocky Mountains. This sonata has received several performances, including one by Dousa’s wife Nayeli López Romo, who is also a pianist, at the Autonomous University of Ciudad Juárez about five years ago. Dousa showed his experience as a composer and pianist while performing his own work. With various music degrees from Ball State University, Central Michigan University and Harvard University, where he graduated with the highest of honors from the Ivy League school, Dousa’s compositions have been performed in conferences, recitals and festivals throughout the United States and in 11 countries around the world. Nordstrom is no stranger to the professional field of music. He’s a violinist with music degrees from the University of North Texas and the University of Cincinnati College-Conservatory of Music. Nordstrom has held extensive performances as a soloist, chamber musician, and in orchestral groups throughout the United States, Mexico, Canada, Europe and China. Additionally, he performed as a violist accompanied by Dousa on the piano in the recording of a CD, which the two put together. Conclusively, both musicians have worked numerous times together, reinforcing their relationship through music. “We’ve played together quite a few times. I think this is–at least at UTEP–the third recital we’ve done together. And two of them have been of his music,” Nordstrom said. Putting music together is a long process of constant correction and steps to create the final product. Thinking of melodies and harmonies doesn’t necessarily come while playing an instrument, trying to figure out a good phrase. To Dousa, it came during his leisure time when he goes out for a run or a walk in the desert. In both composition sets, Dousa decided to write for violin, as he feels that the instrument produces a variety of sounds and special effects. In addition, Dousa and Nordstrom have been great friends and colleagues. “To have the opportunity to, you know, write for this instrument and to perform it with someone who I get along so well, both personally and musically, is a real joy,” Dousa said. Composing music is one thing, difficult and requiring of skill, but learning music and learning it in a way that it comes out as naturally and eloquently as possible is another. For a musician with experience as Nordstrom, the most difficult aspect he had to battle against while learning Dousa’s composition was time. As students and colleagues showed to watch Nordstrom and Dousa perform, Dousa hopes that his audience is inspired by his work and appreciates the artistry that goes behind composing music and producing it at the best quality.